Book Jacket: "Sussex, England. A middle-aged man returns to his childhood home to attend a funeral. Although the house he lived in is long gone, he is drawn to the farm at the end of the road, where, when he was seven, he encountered a most remarkable girl, Lettie Hempstock, and her mother and grandmother. He hasn't thought of Lettie in decades, and yet as he sits by the pond (a pond that she'd claim was an ocean) behind the ramshackle old farmhouse, the unremembered past comes flooding back. And it is a past too strange, too frightening, too dangerous to have happened to anyone, let alone a small boy. 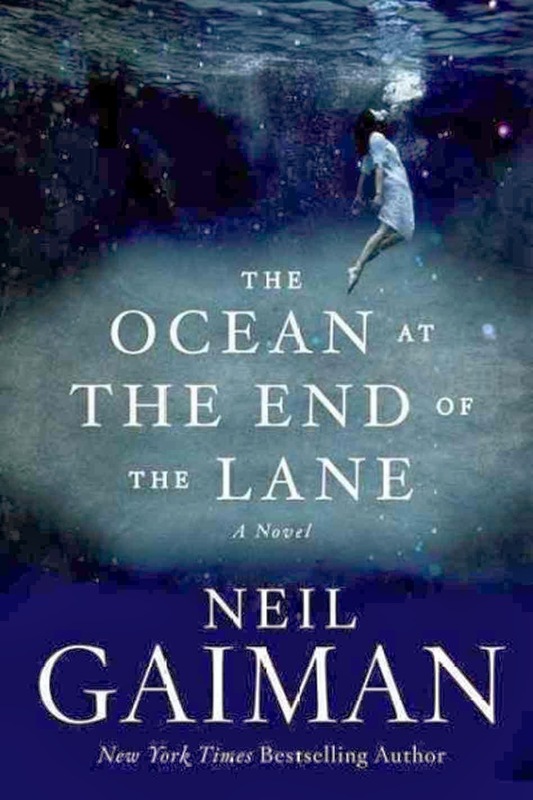 A groundbreaking work from a master, The Ocean at the End of the Lane is told with a rare understanding of all that makes us human, and shows the power of stories to reveal and shelter us from the darkness inside and out. It is a stirring, terrifying, and elegiac fable as delicate as a butterfly's wing and as menacing as a knife in the dark." Taryn's Review: This book was recommended to me, so I added it to my library order without much thought. I was unfamiliar with the author or his works, but for me that is part of the fun of recommendations! I'm not one who normally selects books from the genre of science fiction/mythical/fantasy. The beginning of the book started off like any other, but quickly introduced the element of fantasy. After doing a little bit of research on the author after I finished the book, I understand that his other books also have a mythical aspect. At first I was completely perplexed about what was happening, especially when the little boy finds a worm in his body, but I ran with it and I'm glad I did (even if it grossed me out somewhat). The perspective of seeing what has happened from the eyes of the boy versus his memory as an adult was such a great shift. There is no doubt in my mind that Gaiman is a very talented writer; I was engrossed by the story quite easily even though it was out of my comfort zone. The Hempsworth family was really interesting to read about and I think it would be awesome if Gaiman wrote a book on the Hempsworth family history. After I finished the book, I wanted to know more about Neil Gaiman. He has a strong following and many of his fans wrote that this wasn't their favorite Neil Gaiman book, but still a good one. I'd definitely read another Gaiman work and have put his book American Gods on my to-be-read list. This is a really small book coming in at under 150 pages, so definitely check it out if you're interested. My first Gaiman was The Graveyard Book and I've been dying to read the rest of his work since. Thanks for the review... looking forward to reading it!